Somehow I got myself into a mood the past few days where instead of actually writing posts, I started ruminating about why I write a blog, whether I’ve really accomplished much with it, and so forth. Instead of giving my creativity room to run around and have fun (which is, of course, the reason why I write a blog—it’s not that complicated! ), I got sucked into a pointless black hole of navel gazing. Then I decided to just sit down and write a blog entry anyway, inspired or not, to let the air out of my own absurdities. Because I don’t have a pretty bellybutton ring like my daughter, I refrained from illustrating this post with my actual navel and instead took a photo of a navel orange on my kitchen counter. That looks so goofy, I feel better already just seeing it in the preview! There is no profound, world-changing insight to be found in this post, except perhaps the simple observation that I never was obligated to produce world-changing insights on a regular production schedule. 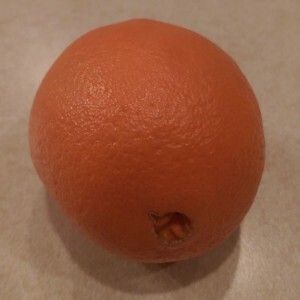 And what’s more, the next time I start taking myself and this blog too seriously, I’m just going to come back to this post and gaze at the navel orange until I go away giggling.